Written for Magpie Tales #184. Click on the links below if you would like to read Eli's adventures up to this point. Remember Eli? He's the guy who woke up in a giant bird nest. As it turned out it was really a dream, but what had precipitated it? His mother told him fairy tales about giant birds who lived in the enchanted forest. They even raised a child among the tree tops and made her a princess of their family. That was just a fairy tale, or so she said. She never admitted any different or denied the possibility that it was more truth than fiction. When we last saw Eli, he had just woken up with a substantial hangover after drinking himself into oblivion over a redheaded vixen named Judy in the Come As You Are Saloon. With his head throbbing, he stumbled into the bathroom reaching for the alka-seltzer, or pepto or anything else that could slay the herd of elephants stampeding through his head. "Why?" he asked himself over and over again. "Why do things like this always happen to me?" He fell back on the couch and drifted off again. Soon he was dreaming of tall trees and sunlight streaming through to the moss-covered ground. On a branch just above his head he saw a woman. She was beautiful with soft brown curls framing her face. What he noticed then took him aback. She had the most magnificent white wings. Was she an angel? Had he died? Shortly before he had felt like it. "Who are you?" 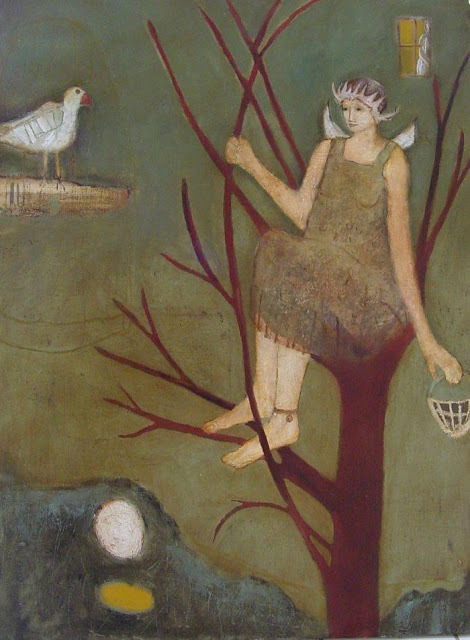 he asked, puzzled that there would be a winged woman in a tree. "Fear not, Eli" she replied in a singsong voice, "for I am your mother. You do not recognize me because to you this is a dream. This is the only way I could tell you the truth. I know you have wondered for a long time. I know of your dreams. I was part of those dreams. It was my way of bringing you to the truth." "Mother" he began, searching for words. "All those fairy tales about the princess...that was really you after all wasn't it? I felt it in my heart, but knew that logically it was impossible. Birds are birds and people are people. People don't fly or live in trees, well except for Tarzan, and he didn't fly." As he stood there silently staring up at the woman in the tree, he saw her begin to change. Gradually her soft features became more angular and her curls changed into sleek white feathers. The basket she had held in her hand fell to the ground. Suddenly there on the ledge appeared a white bird, and much to Eli's surprise he understood what was being said. "Come Princess, it's time to go. He knows the truth now and that knowledge will serve him well." "Yes" replied his mother, "He will be all right now." The Quote of the Week will return next Monday! You have a great imagination. I love how you melded the three stories with this one. To be honest, I had forgotten the Eli stories. I went back and read them again. It made this story all the better. I'm glad things are clearer for Eli now. I remember Eli! Although I did have to go back and re-read because I had forgotten quite a few of the details. I like that you've revisited this character. There are some things in life that you don't want to skimp on. Toilet Paper, Nuclear Reactors and Work Shoes. Just go ahead and spend the extra money and get the very best. You'll never regret it. 'Tis a magnificent tale, you have told! Meleah- Glad you liked it. Trying to pick up the blogging pace a bit now. Sara- Thank you. It is easier when I have something to build on. I think things will be better for Eli going forward. Nicky- He reappeared in the last writing challenge. I like to check in on my characters from time to time to see what they're up to. Timothy- I quite agree with you...just not sure how that relates to Eli's situation. Kutamun- Thanks so much! Glad you stopped by. Jerry E. Beuterbaugh- Thank you kindly. I appreciate your stopping by. I'd forgotten about that particular fairytale. Loved this, Linda.